Located in West Africa with an Atlantic coastline, Liberia was the home for an ITTF Level Two Coaches Course from Wednesday 2nd to Wednesday 9th May; the whole itinerary being held at the premises of the Liberia National Table Tennis Association situated in the country’s capital city of Morovia. The course conductor was Ahmed Dawlatly, the ITTF Technical Expert, who was making his third visit to the country having led an ITTF/PTT Level One Course in 2006 followed by two ITTF Level Two Coaches Courses in 2007, one for men, one for women. A total of 11 students attended, nine from Liberia; the visitors being Yves Ndizeye from Rwanda and Nigeria’s Ajayi Samson Kolawole. One of the participants was Larmie Freeman Junior, the Secretary-General of the Liberia National Table Tennis Association; notably he is involved in the new coaching pyramid being built by the national association. A positive response from Larmie Freeman Junior, it was the same from Yves Ndizeye. Delighted students but arguably the most delighted of all was the Ahmed Dawlatly. 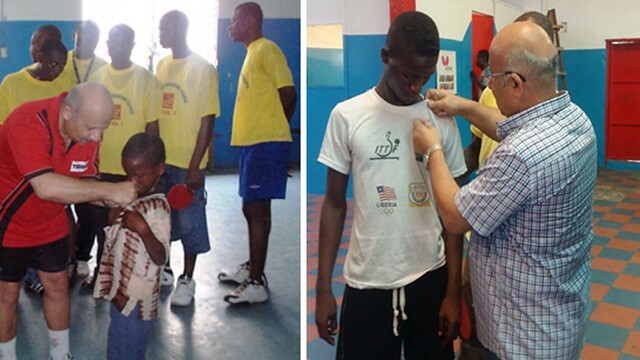 “During the training camp attached to the 2007 ITTF/PTT Level One Course, a small boy called Lasana Weh, seven years old, was rewarded with a small pin as an appreciation to his talent and hard work. It was for my utmost happiness to see Lasana, present in this training camp as the best player in Liberia! Two pins, 11 years difference! He certainly earned his second pin!” Ahmed Dawlatly. Proceedings concluded with His Excellency, the Chinese Ambassador to Liberia receiving a delegation from the Liberia Table Tennis Association to discuss the future for table tennis in the country. The outcome was most positive; a scholarship was awarded to Lasana Weh to attend training in China alongside his coach, as well as equipment being presented to the Liberian National Table Tennis Association. His Excellency, the Chinese Ambassador to Liberia asked that a written request be submitted immediately for proceedings to start; grateful thanks to China.